Long before the days of the furious, frantic thrash of 20 20 Cricket, when the game proceeded at a gentle rhythm, the draw was a standard result, and the ball cleared the boundary rope without bouncing far less often than it does today, cricket’s perfect storm broke. Without warning, almost as if he just felt like it, the greatest cricketer of his day despatched all six balls in an over for six. It could only be done once for the first time. Cricket has other records that will inevitably be smashed. There will be bigger scores, faster centuries, examples of the ball struck further, just as athletes will hurl a javelin further, just as microscopic slivers will always be shaved off the 100m or the 1500m record, although some targets, such as the 3½ minute mile may never be achieved. But even if the game is still played centuries from now, Garfield Sobers will be remembered as the first man to hit the perfect six off six deliveries. Scene: a street in Swansea on a quiet Saturday afternoon in 1968. You rarely see cricket balls bouncing in the road. Not as unlikely as a meteorite landing in the desert, but, for an object out of its normal environment, it is not so far short, on the level of improbability, of ice skaters pirouetting on grass. So when a hard, red sphere, weighing five ounces, came fizzing and spinning to a halt in St Helen’s Avenue, Swansea at around 5 o’clock on Saturday, August 31st, any passer-by would have first been startled, then relieved not to have been injured, then puzzled. The rational observer would have quickly eliminated the possibility of mischievous aliens aiming familiar objects at Earthlings, in favour of someone having hit the ball out of the nearby St Helens cricket ground, a distance of more than 100 metres. The ball has often been struck hard at this famous stadium, but to launch it over the East Terrace and clean out of the ground would have been quite a feat. If the hit itself, to land the ball this far from the wicket, was as improbable as summer snow, the full sequence of play, of which it was the culminating episode, passed straight into sporting legend. Let’s loiter outside the ground a little longer, near The Cricketers pub, which features in one of Dylan Thomas’s short stories, and introduce Pontardawe schoolboy Richard Lewis. Now the speculation about the innocent bystander above is no more than that. It seems nobody saw the ball land or bounce. It was Lewis (who was to become a history teacher in Birmingham) who searched for it as he was leaving the ground “on his way home to tea” in one writer’s endearingly old-fashioned turn of phrase. He found it in the gutter. Lewis’s honesty deserves more than a mere footnote in this epic tale. He could have pocketed his trophy and walked away into obscurity, whistling innocently, as boys do. Instead he took the path of righteousness – this was, after all, in the shadow of several large chapels – and handed it in later, thereby earning himself an honourable supporting role in one of the most famous events in sporting history. Sport is a fantasy, a suspension of normal life in an enclosed space, shared by like-minded people. The more intense the mood is inside the ground, the more prosaic and humdrum, by contrast, is the everyday life that continues in the streets around – or so the spectators might conclude. Only in fiction – the final scene in Bizet’s Carmen, outside the bullfight stadium, is the best example – is there drama without to match or even exceed what is happening within. To spectators arriving late, or leaving early, the sudden roar of 30,000 people at a cricket ground is an agony: it could mean a brilliant catch, an imperious drive for four, a menacing batsman clean bowled for 99. It could mean lots of things, all of which you would rather not have missed. The day not to be outside a ground was August 14, 1948. A sudden volcano of sound from the Oval test match signified Australian batsman Bradman was out for a duck, bowled second ball by Eric Hollies, in his last test match in England. Bradman had needed only four runs to average exactly 100 in Test cricket. He would never achieve that. Another place not to have been outside was Headingley on 5 June 1952, when Fred Trueman made a dramatic impact on his first appearance against India. “After 14 balls of India’s second innings, the scoreboard read 0-4, three of the wickets to the dashing tearaway” Wisden noted. But there was no great crescendo from the few thousand spectators inside St Helens cricket ground in Swansea that afternoon, only an admiring susurration (in the days before ritual standing ovations were offered, as they are today for any routine achievement), tinged with utter disbelief. I know because I was there, sitting on the east terraces with my father. There were student riots in Paris, three weeks of cobble breaking and banner hurling that almost brought down President de Gaulle. In Czechoslovakia the people staged a crazy, wonderful but at the time doomed bid for freedom from the Soviet oppressors. There were huge demonstrations against the Vietnam war throughout the West. Sit-ins and protests continued on UK university campuses, over a variety of issues. It was a year of assassinations: Martin Luther King cut down in Memphis; presidential candidate Bobby Kennedy slain in Los Angeles. A week earlier Basil D’Oliveira was left out of the England team to tour South Africa. The subsequent furore was a significant factor in the ultimate collapse of Apartheid. On October 18, at the Olympic Games in Mexico City, Bob Beamon set a world record for the long jump, bettering the existing record by a remarkable 55 cm (21¾ in.) At the same games American athletes Tommie Smith and John Carlos gave the raised fist gesture at the 200m medal ceremony. Smith said later it was not a “Black Power” salute, but a “human rights” salute. The year closed on a serene, unearthly note as man, for the first time, circled the Moon. Within a year two Americans would have landed there and returned safely to earth. Did that mission succeed because it was not politically ill-fated 1968? With so many remarkable, frantic, tragic, heroic things happening in ’68, the greatest cricket player might as well go and smash the game’s ultimate record. It was part of the iconoclasm. St Helens had been a refuge since my earliest youth. Sitting in a cricket ground for seven hours, with time to read during lunch and tea was a rare indulgence, an extended escape from the “real” world. My love for cricket came from my father, a Swansea boy. Like all true Welsh fans he would switch sports quite naturally with the changing seasons, from rugby in the winter (in his case, Swansea RFC) to cricket, following Glamorgan, in the summer. There was no question of preferring one sport to the other. His passion for rugby and cricket was in equal proportion, and all consuming. And so was mine. Appropriately the BBC commentator that famous day, Wilfred Wooller, was the epitome of that entirely equal commitment. He was both a rugby international, and former captain of Glamorgan. Alun Rees was another, representing Wales and Glamorgan in the 1960s. He played briefly as a substitute in this game. We had gone to Swansea quite late that late summer day, knowing that in cricket something remarkable was always about to happen, except you never knew when. That day? Next week? Next year? Who could tell, but I had seen it there myself. There seemed “to be something about Swansea.” The ground is very close to the sea, and the sandy, quick-drying pitch was said to respond to the incoming tide, to produce fascinating matches and some noticeable results. 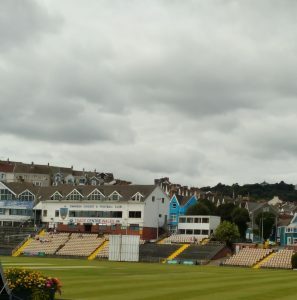 Glamorgan had beaten the Australians only three weeks earlier at this ground, reducing them to 86 for six at the end of the first day. I once saw the same batsman claimed by the same bowler twice in a day of tumbling wickets. There are many examples of big hitting at the ground. In my cricket-going youth, I was lucky enough to see some of them. The elegant Pakistani Majid Khan, who rained sixes down on the members’ enclosure one quiet Thursday morning in 1967 in an innings of 147 in 89 minutes. Majid was the son of Dr. Jahangir Khan, who famously killed a sparrow in flight while bowling against MCC for Cambridge University in 1936. I saw Australian spin bowler Tom Veivers hit six after six one August bank holiday evening, while his partners fell like skittles the other end, when Glamorgan beat Australia for the first time in 1964. Already, and at a young age, I had those memories, so it really didn’t matter what this grey afternoon would produce. These were the days before contrived cricket explosions. You put up with a game which bored the socks off you, because tomorrow – who knew? And then Sobers strolled to the wicket. “Sir Garfield Sobers [was] the finest all-round player in the history of cricket. Once he was established, his sharp eye, early assessment, and inborn gift of timing enabled him to play almost any stroke. Neither a back foot nor a front foot player, he was either as the ball and conditions demanded. When he stepped out and drove it was with a full flow of the bat and a complete follow through, in the classical manner. When he could not get to the pitch of the ball, he would go back, wait—as it sometimes seemed, impossibly long—until he identified it and then, at the slightest opportunity, with an explosive whip of the wrists, hit it with immense power. His quick reactions and natural ability linked with his attacking instinct made him a brilliant improviser of strokes. When he was on the kill it was all but impossible to bowl to him—and he was one of the most thrilling of all batsmen to watch.” – John Arlott, Cricket’s Most Versatile Performer, Wisden, 1975. Similar sentiments rustled around the ground, like wind in the barley. Meanwhile, up in the BBC commentary box, with its back to the Oystermouth Road and the sea, Wilf Wooller, the Godfather of Glamorgan cricket, was describing play. The cameras were rolling, but not for long. The flagship BBC1 sports programme Grandstand had been dipping in and out of the cricket all afternoon, but transmission was about to end. The engineer on duty that day was John Norman, who, incongruously, played rugby for Nigeria in the 1950s when the BBC sent him to work as head of Nigerian Broadcasting. Shortly after 4.45 the Grandstand studio called Norman and told him to shut down the cameras. Norman and his cameraman John Lewis had other ideas. Lewis asked if they could keep the camera on to take a look at Sobers. Norman rang the recording engineer in Cardiff, and told him to switch the tape on, just in case. “It was all really a chapter of accidents,” Norman recalled in an interview. One of them was that the man in the “mid link” van, stationed on the mountain above Maesteg, where his job was to relay the signal on to Cardiff, had not yet driven off home when the order to close down was given. The result would be one of the most valuable sequences in the history of televised sport. Out there on the pitch, however, there was no sign of the mayhem to come. Nottinghamshire needed quick runs, so that they could declare and bowl at the home side before the end of the day. Sobers and his partner John Parkin progressed without hurry. Sobers had reached 40 after an hour or so. My father held high talent in unstinting respect, and I felt he was happy just to be here, to honour Sobers the legend. The occasional swat to leg and sauntered single and, according to Lewis some “sizzling drives”, merely confirmed him in his opinion. I come up with the impatience of youth, hoped for at least a proof of greatness. Enter Malcolm Nash, bowling at the pavilion end. “Malcolm Nash was pre-eminently a highly skilful manipulator of medium-pace seam bowling. A thoughtful and sensitive cricketer, he was never a bowler to settle for the slavishly defensive; but sought to attack and to outwit opposing batsmen. He is, as he ruefully accepts, best known for being hit for six sixes in a six-ball over by Garfield Sobers in 1968. It is less often remembered that he himself once hit four consecutive balls from Dennis Breakwell of Somerset for six. That memory is some balm for him.” – John Arlott, 1984. When play began on August 31st 1968 the record for the most runs off an over of six legitimate balls (and not full tosses, which are easier to hit) was 32 by Cyril Smart of Glamorgan against Hampshire at Cardiff in 1935. A.W Wellard had scored 5 sixes and a 1 in 1938, while Bradman managed 30 in 1934. Even these formidable achievements were scattered over the years. The very historical randomness is a comment on the immensity of the task. Nobody had any reason to expect the total to be exceeded on this day in 1968. Cricket – like baseball – is a game where 11 opposing players strive mightily to stop the progress of the man at the crease, and ideally to get him out. Batsmen aren’t safe simply by striking the ball well. They can be run out after the most brilliant ground strokes. Only the hit for six brings immunity. The perfect six sixes, although technically achievable in any six ball over ever bowled, was never considered by statisticians as “only a matter of time”. We should not compare cricketers to track athletes. 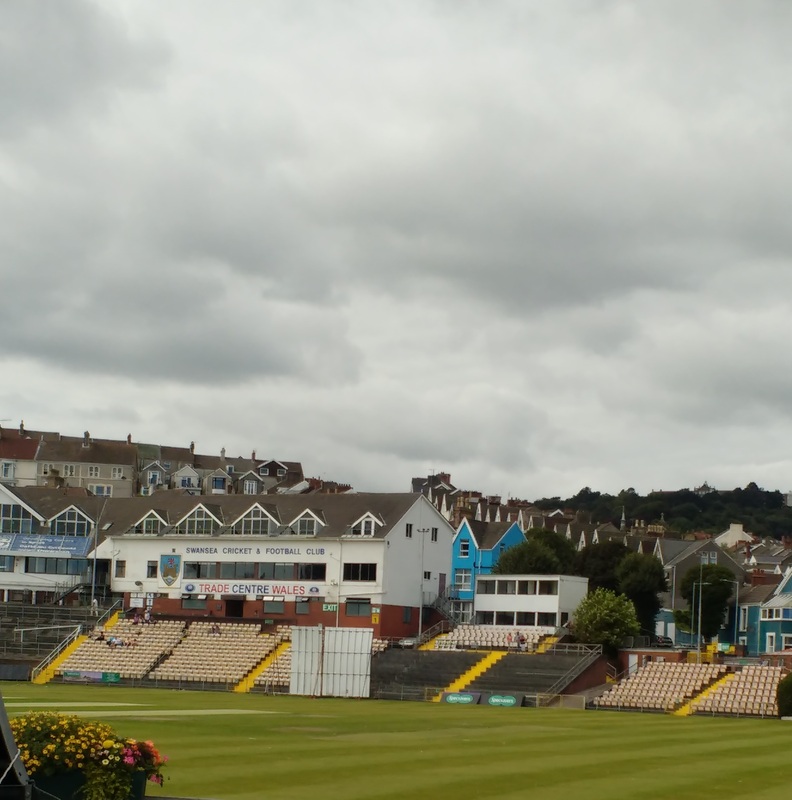 As Nash prepared to run in to bowl his experimental slow-left armers, the left-handed Sobers studied the field again from the Mumbles Road end, with the sea behind him. At the other (non-striker’s) wicket was Sobers’ fellow batsman, John Parkin. Nash ran in off his short run. With the minimum of backlift Sobers punched him over mid-on for six, out of the ground. The crowd murmured. “Well!” said my father. In came Nash for his third delivery, pushing the ball wider to the off. Another triumph for awesome technique over brute force. Sobers hit him back, straighter over wide mid on, into the pavilion enclosure, lifting his right leg off the ground as he connected. Why did Nash persevere with his slow left-armers? Because he believed he was bowling balls good enough to get out a lesser batsmen, and to tempt even this colossus to miss-time and give a catch in the deep. Fourth ball. There Nash was again, off his six step run-up. The delivery was straighter. With the speed of lightning, Sobers pulled the ball over backward square leg and over the mid-wicket boundary into the terrace where we were sitting. It rebounded off the concrete terracing and shot back towards the square-leg umpire. Dad was glowing with excitement. “Gareth, I think we did the right thing today.” Sobers said later that only then did he contemplate going for the six sixes. Is there a name for the condition in the sports fan where you actually will your opponents to do well, provided he does it gloriously? It does not appear to exist in German, which gave us schadenfreude. I found something that might come close, the Buddhist concept of mudita. It means “sympathetic or vicarious joy” or “happiness in another’s good fortune”, cited as an example of the opposite of schadenfreude. One definition is “delighting in other people’s well-being rather than begrudging it. It is not to be confounded with proudness – the person feeling mudita must not have any interest or direct benefit from the accomplishments of the other.” I think that summed up the feeling of the crowd that distant Saturday. So it was Nash to Sobers again, straight and pitched up. Sobers struck the bowler back over his head. But something was very wrong. “It was wide of the off,” he wrote, “and although I caught it well I didn’t middle it.” This ball was flying lower and slower than the last four. Roger Davis, on the long-off boundary, jumped and took the catch. But he was still moving in reverse, back-pedalling. He couldn’t prevent himself from falling backwards. He came to ground over the rope. Now was all confusion and deliberation. Sobers started walking to the pavilion, thinking he had been caught. Davis’s shrug suggested he did not know if the catch would be allowed. There were no big screens in those days. Besides, the technology of the day could not have coped with replays. Tony Cordle, the fielder nearest to Davis, indicated that it was a six. The two umpires, Eddie Philipson and John Langridge, moved together at an unhurried pace, converged and consulted. According to the then experimental change to Law 35, “the fieldsman must have no part of his body grounded outside the playing area in the act of making the catch and afterwards.” Without that change, which seems logical, because the ball still crosses the boundary rope, even if a player is clinging on to it, Sobers would have been out. As Davis had carried the ball over the boundary, Philipson signalled another six. For the first time the ground erupted. We didn’t want this to end. However, in giving the other side a chance, Sobers had revealed himself as the fallible hero. That mistake had evened things up. So there was never any certainty about the last ball. Indeed, the vast weight of cricket history, accumulated in so many dusty volumes, now bore down on Sobers, to say: “It won’t happen”. The story of so many matches, where so many thousands of batsmen have played out so many thousands, even millions, of overs. The odds against this ball going for six too were astronomical. Captain Tony Lewis sent all his fielders to the boundary, most of them on Sobers’ leg side. Glamorgan wicket-keeper Eifion Jones is said to have challenged Sobers: “Bet you can’t hit this one for six as well.” In ran Nash. All he had to do was put it on a spot where Sobers couldn’t hit it, or at least pitch it up so he couldn’t unleash that deadly swing. If only it was as easy to keep yourself out of the history books in the presence of greatness. For the first time in the over Sobers seemed to be really trying. In his words: ”All sorts of things were going through my mind. If he bowled a no ball or wide, that would make it difficult because it would require a seventh ball. [It would not then be six off six.] I felt sure he would try to deceive me, [him] being a former fast bowler I thought he would run up as if to bowl another off-break and then bowl a straight, faster ball. In a microsecond his brain had processed the delivery, and the instant it bounced his bat was describing a glorious arc over his right shoulder. If they ever recreate the over in a movie, don’t let the director slow this sequence down. The drama is the speed. In a heartbeat, the ball was over the boundary above our heads, still rising. “Even if I had a top edge it would have have gone for six, but I caught it right in the middle of the bat and not only did it clear the short boundary, but it went over the stand as well, running down the hill towards Swansea town centre.” We will forgive him the exaggeration of those last ten words. “All the way to Swansea” confirmed Wilf Wooller (more understandable excess) in his television commentary. In another sense, though, the ball went further still. Right around the world. I would like to report that Dad and I leapt to our feet to cheer and whoop and hug one another with abandon, then shout out across Swansea: ”Do you know what you just missed? !” But in those days you didn’t do such things. All around there was a murmur of incredulity, then the sort of warm but restrained applause we wouldn’t recognise today. Pictures show about a quarter of the crowd on their feet, the rest clapping where they sat. Sobers could not possibly follow that, and he did not even try. He immediately declared the innings closed and led the players off the field.